...here's me and my lovely Mama L in the hospital. Only my Mam could still look gorgeous after just having a baby. 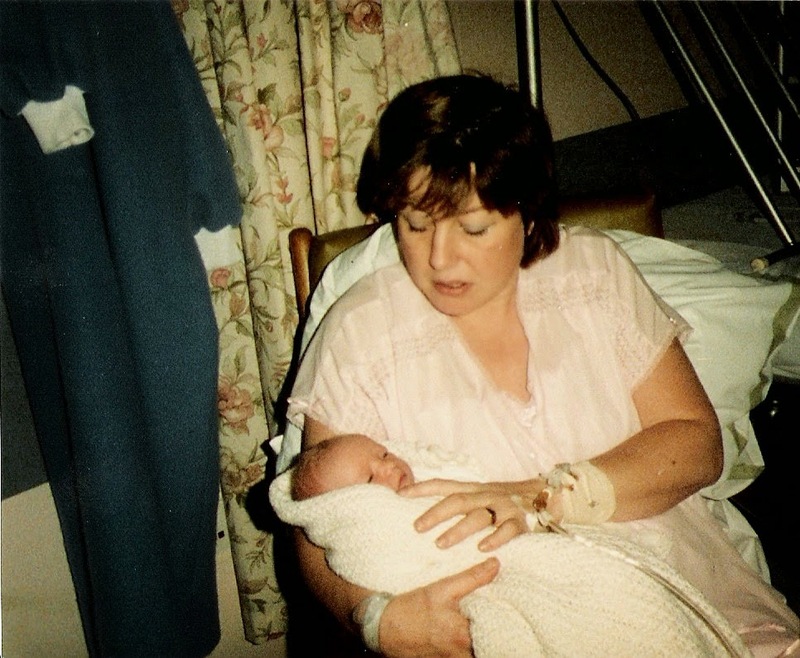 So, because I was the first baby in England, and the first baby in Sunderland to be born on Christmas Day that year, I was in the Sunderland Echo with my Mam (obvs!) and another lady and her daughter. Sixteen years later when I started college I met the other baby (obviously she was grown up too) completely by coincidence and we now cross paths working at the same school. Life is weird like that sometimes. Anyway, back then I wasn't really bothered about having a Christmas Day birthday. I was a baby, what did I know? Even when I was little it didn't really bother me. Yes I had to wait ALL year to have my birthday and Christmas together, but my Mam always made sure that everyone got me a birthday and a Christmas present so that I didn't miss out and I always celebrated my birthday on Christmas Eve with a little tea party and all of my family together. This suited me fine until I was sixteen. My eighteenth however was entirely different. For my sixteenth I had a massive birthday party right at the beginning of December. I even remember it now being such a fun night; dancing to Steps and S Club 7 and thinking I was really cool in my glittery denim on denim (I know, you're jealous right?). Then, nearer my birthday my friends organised a limo ride for me which was hilarious in the snow! It was definitely a night to remember. For my eighteenth, I decided to have a seventies fancy dress themed party which I was really excited for, but just before the main event around thirty people cancelled 'because it was too near Christmas'. It was still a great night for my family and the select few of my friends that did show however, 'it's too near Christmas' pretty much became the mantra for all of my birthdays thereafter. So for my 21st, I opted for a family meal, and a couple of nights out for the birthdays to follow...then I stopped celebrating. ...I also really enjoy having loads to open now on Christmas Day. I always do really well and feel really special and loved. It never feels like it's my birthday though...I guess it's the key to eternal youth!! I've got to say I absolutely loathe 'Merry Birthday' cards (sorry in advance if anyone's bought me one!). Just because I have a Christmas day birthday doesn't mean I don't deserve a normal card. Or the worst offenders are the ones that write 'and a happy birthday' in your Christmas card (it doesn't bother me so much if they wouldn't normally buy me a birthday card...but for those who should it's cheating!). But my favourite part about having a Christmas Day birthday is that it gives me an excuse to be super excited about Christmas...I'm talking big kid, borderline Elf when he knows Santa's coming excited! And also, I never have to work on my birthday (whooop!). A common misconception is that you get two lots of presents and yes I probably do, but remember I don't get anymore than you would get if yours were all on one day. I am lucky though and the people that matter are always really good to me! Anyone else have a Christmas Day birthday? PS-thanks to Chloe for the inspiration to write this post, hope it's answered some questions! Aw Kay! Your only the second person I've met with this birthday.. I do feel for you.. I mean, I moan about my birthday and that's 10 days before yours! But I'm sure the same applies a little. My parents didn't put Christmas decs up till the day after my birthday. They bought me a decent gift in the middle of the year and said it was my second birthday present. I used to hate Christmas cards with happy birthday written in them and 'joint' presents. Parties were always a pain, as most of my friends had swimming parties and did activities and bouncy castles.. I had.. discos.lol I think this is where my teeny bopper side comes from. (I know all the moves to the party songs! ;) ). Getting older I faced new woes of trying to organise nights out around peoples work do's, plus the expense of another night out along with Christmas present buying etc etc etc.